A storied racing career that began back in the mid-seventies is about to embark on a new chapter. When the layers are peeled back, the four decades of Top Fuel Motorcycle drag racing is about much more than thousands of gallons of nitromethane, hundreds of blown engines or records broken. It’s about the burning passion that has shaped a man and his family’s lives. Larry McBride celebrates with his team in the winners circle. If you told 20-year-old Larry McBride he’d be going for his 20th Top Fuel Motorcycle championship at age 61, he’d never believe you. Back then McBride worked long hours as a mechanic at Cycle City Corp., formerly Casey Cycle near his home in Newport News, Va. It was an employer who helped support his drag racing genesis, in the dirt nonetheless, on a 1975 Suzuki T 500. At the time the modest opportunity was more than the McBride brothers could ask for. Before he was the Spiderman, Larry McBride got his drag racing start in the dirt. Fast forward to 2019 and McBride is the quickest and fastest motorcycle drag racer in the world at 5.61, 258 mph and has put together one of the most remarkable strings of dominance the sport has ever seen. Aside from a 2005 season, where he was sidelined by medical issues, the Spiderman has won the championship title every year since 1998. “It’s hard to believe I have been doing it that long,” McBride said. From his early days on a Harley, to influential mentors like “Squeaky” Newton Bell, Danny Johnson and Elmer Trett, McBride says many are to credit for his longevity and success. After his friend and mentor’s untimely death in 1996, McBride dedicated the first five second run in 1999 to Trett. It was the achievement of a lifetime and something McBride says would not have happened if not for Trett. Friends, competitors, sponsors and even motorcycle drag racing sanctions have come and gone in the past four decades, yet McBride has stood the test of time. The childlike zest and passion the man has for the sport has him as excited and as energized for the 2019 season as he’s ever been. 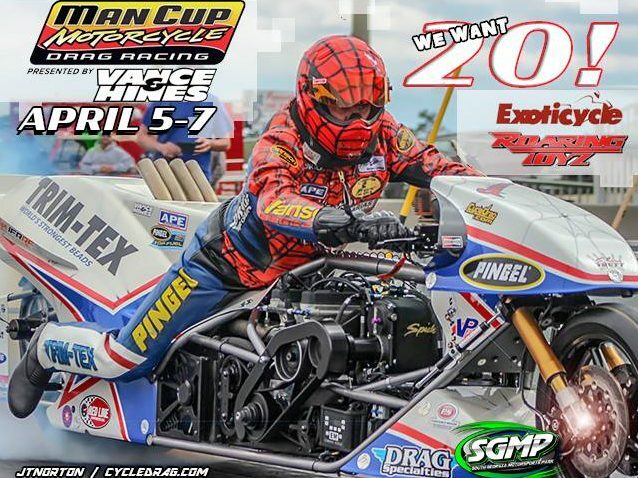 McBride’s drive for 20 titles begins at the Man Cup Exoticycle Roaring Toyz Spring Cup from South Georgia Motorsports Park in Adel, Ga, April 5-7. McBride is trying not to dwell on the significance of the career milestone. McBride is so focused on achieving his goal, he worked hard in the gym and drastically changed his diet to lose more than 22 pounds over the off-season. As for the 5.61, 258 mph records, McBride sees both as realistically breakable. But as he’s said for the past 40-plus years, it’s the win light that really matters. “If we focus on doing our job and going rounds, the records will come,” McBride said. Here’s to a great 2019. Enjoy the show. Qualifying gets underway for the Spring Cup on Friday April 5th. “Come on out and see us this season and get a t-shirt,” McBride said. There are more videos on the Cycledrag Youtube channel (please subscribe here) and the Cycledrag.com Facebook page (Please like here) and more will be coming all throughout the off-season. Stay connected!